1 Cover an acrylic base with parchment paper or an acetate sheet and create an 8 × 14 in/200 × 356 mm rectangle using ½-in/13-mm metal bars. 2 Preheat oven to 340&F/171.1&C. Spread the pistachios and almonds on a baking sheet and roast for 5 minutes. Let cool. 3 Combine the tempered milk and dark couverture and the gianduja in a bowl and mix to incorporate well. 4 The mixture should be thick yet pourable. If it is too warm and runny, pour onto a marble and temper until it reaches the correct consistency. 5 Add the nuts and orange peel to the gianduja mixture and mix gently. 6 Using a triangle spatula, spread the mixture into the rectangle between the metal bars. Place a piece of parchment paper or a Silpat on top of the gianduja and use a rolling pin to roll the mass into the corners. Let set at room temperature until firm. 7 Remove the bars. 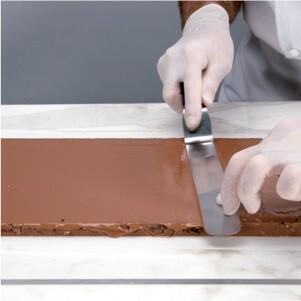 Precoat the slab with a thin layer of tempered milk couverture. 8 Once the couverture has set, flip the slab over and use a knife to mark guidelines along the 14-in/36-mm side at 1 in/25 mm intervals. 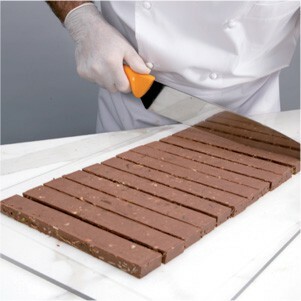 Using the lines as a guide, cut the candy into 8-in/20-mm bars. 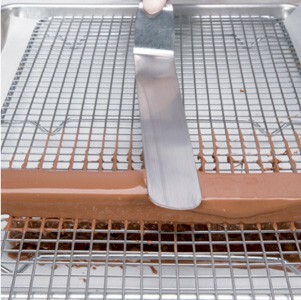 9 Using a dipping fork, dip each bar into the milk couverture and place on a cooling rack. 10 Level off any excess couverture with an offset spatula, and tap the cooling rack so the excess runs down the sides of the bar. 11 While the couverture is wet, use a knife to mark the tops of the bars with diagonal lines or pipe decorative designs on top with dark couverture. 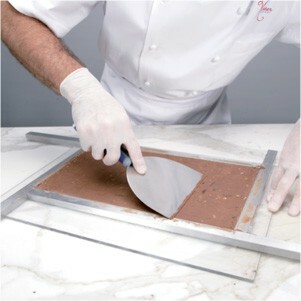 Before the couverture completely sets, trim the ends of the bars to expose the gianduja mixture. Cut the bars into ¾-in/20-mm pieces. Let the couverture set completely. 12 Store in an airtight container at 57& to 61&F/13.9& to 16.1&C in a dark, dry place. 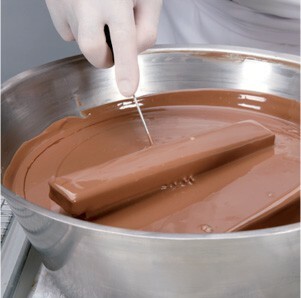 – Spread the gianduja mixture between metal bars and let crystallize. – Remove the metal bars and evenly spread a layer of couverture on top. 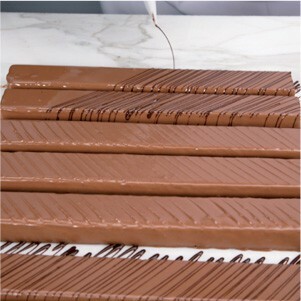 – Dip each bar in tempered milk couverture. – Place the bars on a cooling rack and level off any excess couverture. – Decorate the bars with either a knife or piped tempered couverture. Omit the dark couverture and increase the quantity of tempered milk couverture to 450 g/15.9 oz/1⅔ cups. Omit the tempered milk couverture and increase the quantity of dark couverture to 350 g/12.3 oz/1¼ cups.